Andi loves exploring, especially in the great outdoors. This summer we have gone on many hiking adventures. We love hiking at Phelp’s Park, Dunning Springs, and Lower Dam in Decorah, and this summer we began exploring hiking trails across Northeast Iowa. We loved Pikes Peak State Park in McGregor. The views were fantastic! A fun filled morning at Dunning Springs in Decorah – make it to the top of the stairs for a beautiful view of the waterfall! 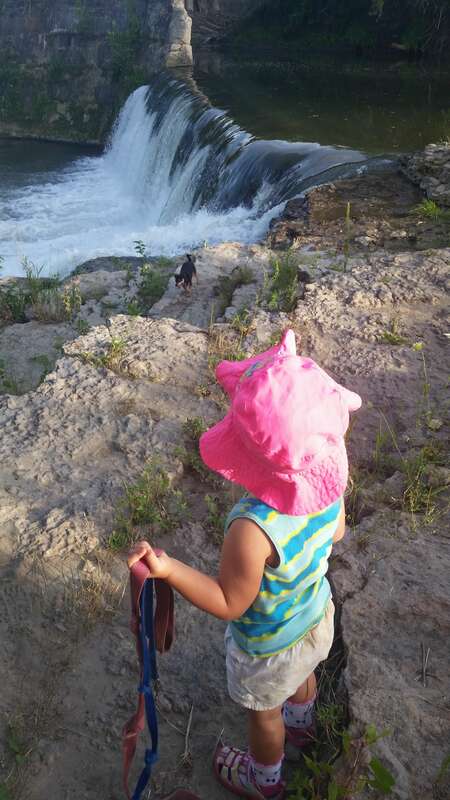 At two-years-old, Andi is more into exploring and wondering than actual hiking, but it still fun for the whole family (especially our two dogs!). 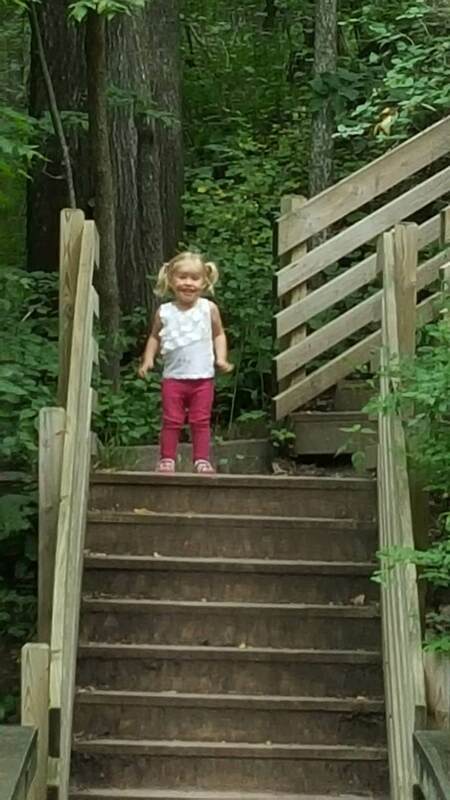 Northeast Iowa has an abundance of beautiful hiking trails for all ages. Whether you are looking for a casual scenic walk or a vigorous trek, there’s a trail for everyone! Check out some of these hiking locations and tips for hiking fun in Northeast Iowa. Hiking Trails *These hiking trails in Northeast Iowa were both voted in the top 12 best hiking trails in Iowa. Explore, discover, and enjoy! Effigy Mounds National Monument in Allamakee County has over 2,526 acres to explore. 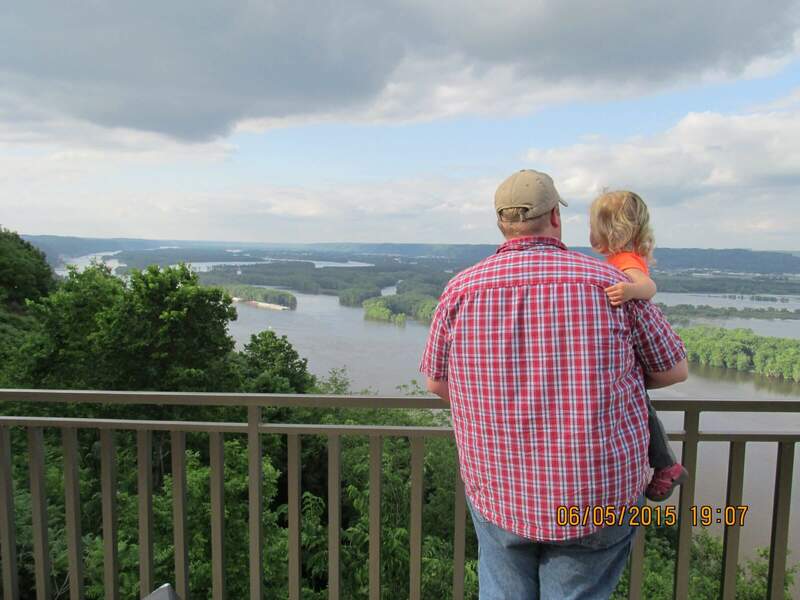 Take a guided tour of Spook Cave, and take a hike to discover fantastic views of the Mississippi River Valley. Pikes Peak State Park in McGregor is a great place for a hiking or biking adventure. Hikers can explore beautiful bluffs and valleys while viewing limestone and fossil remains. The trails lead to Bridal Veil Falls or Point Ann which overlooks the town of McGregor. Biking is another great option. The Northeast State Park Bike Route is a 130 mile path that connect Pikes Peak, Wapsipinicon State Park and Backbone State Park. Bring plenty of healthy snacks! Stay hydrated – drink lots of water. When starting, hike short distances and commit to hiking at your child’s pace. Young kids, especially toddlers, typically prefer to wonder and explore instead of going long distances. Go with the flow, and be prepared to stop your hike earlier than planned. Focus on fun instead of longevity! Start hiking when kids are young, and help them to develop a love of the outdoors. Let kids participate in hike planning. Emphasize fun – play games, go on bug hunts, discover fun destinations, or try geocaching. Sing songs or go on a scavenger hunt as you hike!